But mom, this hat is not even for me! Pattern: Thorpe by Kirsten Kapur. Yarn: Madelinetosh Tosh Vintage, 100% superwash merino, lepidoptra (less than 1 skein) and lapis (much, much less than 1 skein). Gauge and finished dimensions: at a gauge of about 5 stitches per inch, this hat is about 18″ around and 8″ from crown to the edge in the front. I knit the garter stitch brim flat and then seamed it, just like last time. Not my first time knitting this pattern – I still love it! 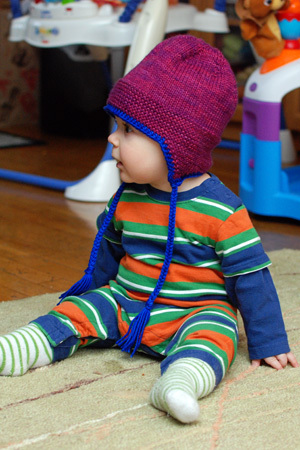 I adjusted the numbers to fit my yarn, and to make a hat which is about 18″ in circumference. The intended recipient turns 1 in a few days, and this hat is meant to fit her next winter, when she’s 18-24 months old. Conveniently, I should be able to use the same numbers and the same yarn (what gorgeous colors!) to knit Gregory a hat for next winter, too. I might use the lapis as the main color for Gregory, I think it looks great on him! Adorable! The hat is cute too! I am a confirmed baby-clucker. LOVE babies. But yours truly is one of the cutest ever!!!!!!! any color would look cute on that little face! Sooooo freakin’ cute!! And the hat, too! I agree! Master Cuteness looks great in that wonderful, intense blue :-). Gregory looks adorable, no matter what you put on him, but the hat is lovely. He is SO cute! Love the hat too! Very nice – great colors! And your captions from Gregory crack me up! Yeah but he’s so darn cute in it. Awwww. What a cutie patootie! Love the hat. Love Gregory. Gregory is without doubt one of the most photogenic children I have ever seen. 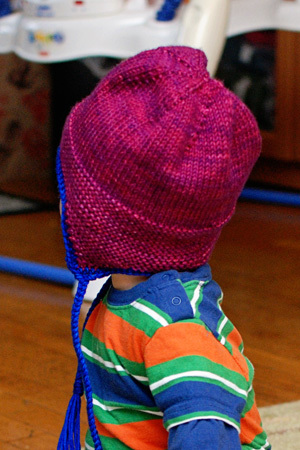 The camera absolutely loves him…and his Mom’s knitting! He sits up so well, and the hat is cute too. I am a grandmother what do you expect? Oh my gosh, could that hat or your son be any more adorable? Love that hat pattern as well. It’s just so right in every way! I’m going to have to try that yarn. I’ve not used that particular Madelinetosh yet, but it looks great. So cute! 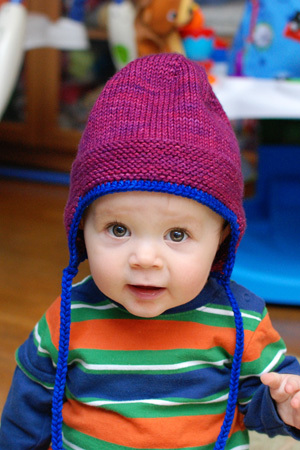 Cool that you posted the pattern, my husband keeps bugging me to make him one of those hats for work. You have the cutest model. I might have to try this pattern. Gregory looks great in anything! The blue would look great on Gregory! He is such a cute, happy baby! Great hat, and yes, I think Gregory’s should be the blue but maybe with pink trim so he stays in touch with his feminine side. Adorable! I love that he’s in such bright colors! Awesome. I love that your little one isn’t completely grumpy with the modeling. OK, I keep seeing these pics of Gregory, and thinking to myself how amazingly beautiful he is, and thinking that you have to know that he is one of the most handsome, photogenic babies I’ve ever seen. The hat is pretty cute too. Oh my – both the hat and the little dude. Wow, adorable. Beautiful hat. Gregory is so cute. Time flies, and now look at him sitting up — so cute.